Arizonans get their own moment to say thank you and goodbye to late Senator John McCain on Wednesday as he lies in state in the Capitol rotunda. Expect to see several poignant moments starting with dozens of first responders, veterans and military personnel who will line the capitol plaza. 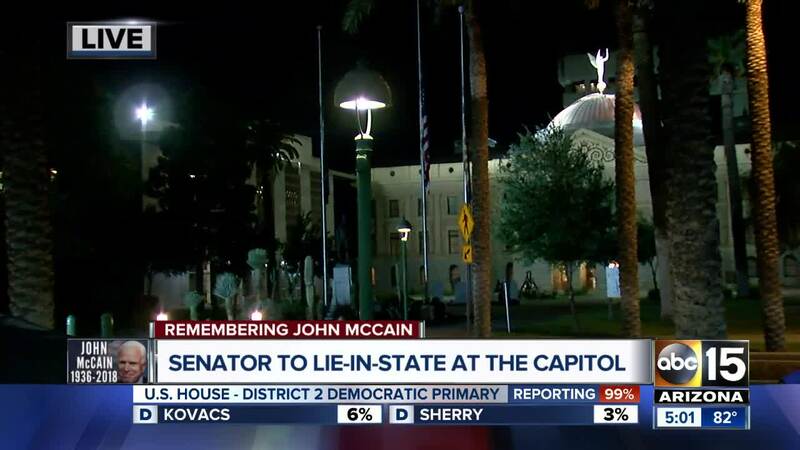 They will welcome the motorcade arrival just before 10 a.m.
A carefully choreographed ceremony will follow as the Arizona National Guard Casket Team will carry Senator McCain inside where he'll be placed over the state seal in the rotunda. The McCain family will be greeted and escorted in by Governor Doug Ducey and the First Lady of Arizona. The remembrance ceremony starts at 10 a.m. and several prominent Arizona politicians will speak and present a memorial wreath. Each is someone the senator called a friend, some of them fellow veterans as well. His fellow senator Jeff Flake, former Senator Jon Kyl and Former Congressman Jim Kolbe are all taking part. 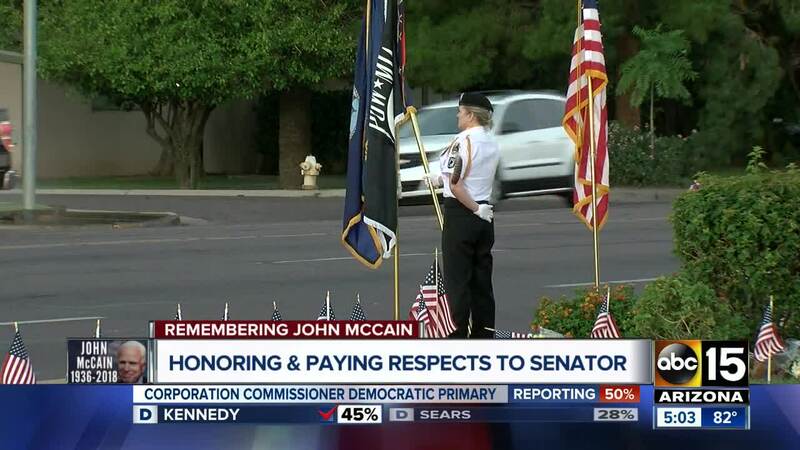 When it all wraps up the public will be allowed in starting at 2 p.m.
Community members are expected to line the streets of Phoenix as Senator McCain's body is brought from the mortuary near 7th Street and Bethany Home Road to the Arizona State Capitol. Private services will begin at 10 a.m. on Wednesday at the Capitol. 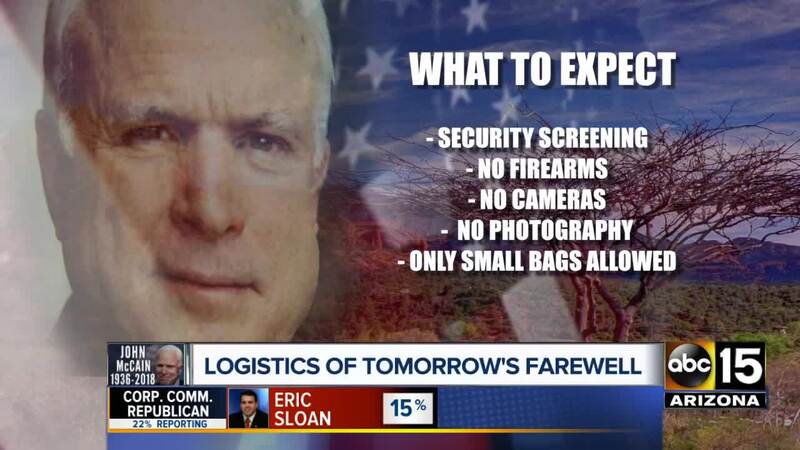 At 2 p.m., the public will be allowed to visit and pay respects to Sen. McCain. The public visitation is expected to last through the evening. The Arizona Department of Public Safety warns that no cameras or firearms are allowed at the viewing. DPS is also urging the public to take precautions and be prepared for the heat by hydrating, wearing protective clothing and sunscreen, and keeping an eye out for those who may be experiencing heat illness. DPS says to report any potential dangers to 911 or the nearest state trooper. Visitors to the State Capitol are being encouraged to park at the Arizona State Fairgrounds and will be bussed to the Capitol. Shuttle service begins at noon. There is NO CHARGE to park at the fairgrounds or for shuttle services. DPS is urging attendees to arrive early to find an approved/authorized parking spot. Take a look at the map below for details on restrictions and authorized parking. For those who cannot make it out to memorial events, they will be live-streamed online . His burial will be private following a private memorial service at 2 p.m. on Sunday at the U.S. Naval Academy Chapel.